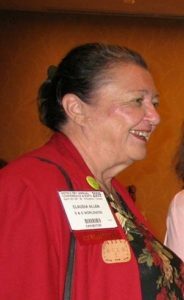 The Cognitive Disabilities Model, first proposed by Claudia K. Allen, M.A. OT, FAOTA, has been used by occupational therapists for over 40 years with persons whose optimal functional performance appears to be impacted by possible cognitive impairments. It has evolved over the years along with advances in scientific understanding of mental disorders. The CD model focuses on understanding functional cognition, or information processing capacity applied at the performance skill level. Understanding abilities is accomplished through systematic skilled observation of people as they perform activities. This model is distinguished by its use of the Allen Scale, a hypothetical hierarchy of brain based abilities which are observed as predictable patterns of behavior during performance of activities. The performance patterns that comprise the Allen Scale also describe the degree of complexity of activity demands that are introduced by objects, procedures, and problems in activities. The goal of all interventions in the CD model is to promote safe engagement in valued activities, in supportive environments thus allowing clients to experience their Best Ability to Function. Click here to view .PDF Brief History of CD Model.